Read This Guide Before You Decide! Download our FREE eBook to learn all about the best ice makers selling today and the features that matter most. ​The Wintersmiths Crystal Clear Sphere Ice Maker is the best gourmet ice ball maker around. It produces crystal clear ice, something most ice ball makers are unable to do. 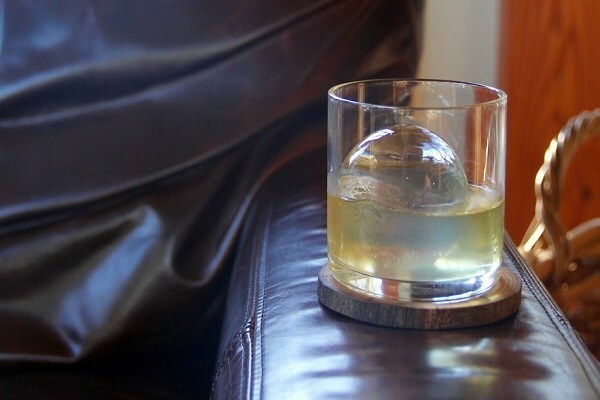 Because of their elegant look and slow-melting nature, these large (2.4") ice balls are perfect for cooling your best whiskey, vodka, rum, and highball cocktails. The ice chest is easy to use at home. You don’t need any special water or skill to create a perfectly round and clear ball of ice. This is the second Kickstarter project by Wintersmiths. The first was the $69 Ice Baller that makes a single clear ice sphere using ordinary tap water. That project raised $173,000. The earlier Wintersmiths ice chest launched on Kickstarter in 2014 was also a hit. They raised $241,000 for it. This new Wintersmiths ice maker + ice chest has a much larger capacity than the original Ice Baller. Instead of making just one ice ball, you can make four at a time. The best part is how easy it is to use. 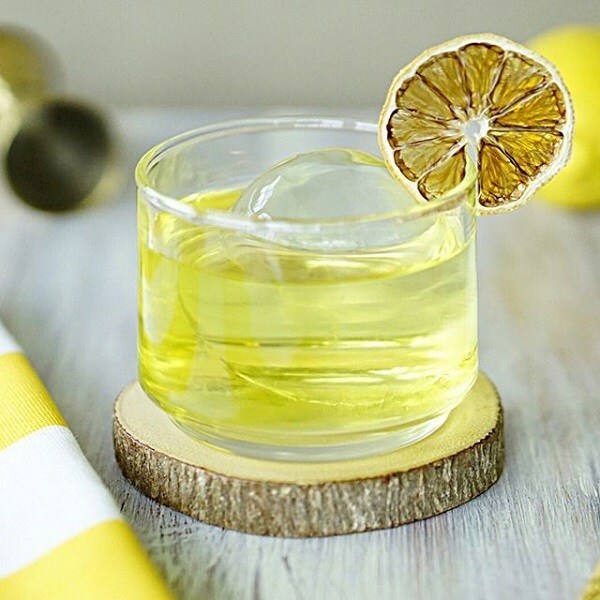 Using just tap water and a freezer, you can make similar quality ice ball like the ones you find at high-end bars where they use expensive and sophisticated ice ball makers. The Wintersmiths ice maker costs ​about $120 with either the sphere molds or cube molds. For an additional $40, you can get it with both types of molds. Standalone clear ice makers can cost as much as $2,000 or more. With just over a hundred bucks you can enjoy clear gourmet ice at home. The only disadvantage is that you can only make four ice balls, which takes at least 24 hours. For most people that’s not an issue. But if you want a higher-capacity standalone clear ice maker, see our gourmet ice makers buying guide for the best options. Oh, and by the way, they have another bigger capacity clear ice maker on Kickstarter that’s available on pre-order. It can make up to 7 clear ice balls and up to 16 ice cubes. The Phantom Ice Maker has raised more than $400,000. 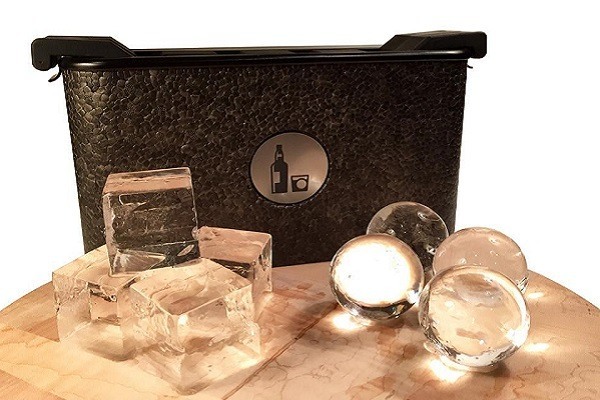 The new Wintersmiths ice chest can make up into four ice cubes or balls. 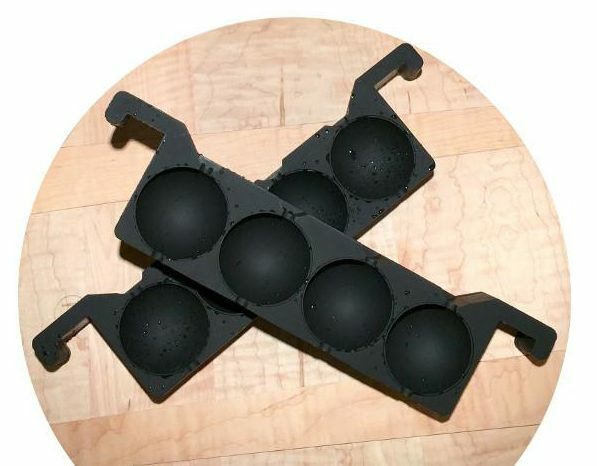 As I mentioned, you can choose the balls mold, cubes mold or both types of mold. Each comes with four shaped grooves. Once you add tap water to the chest, it takes 24-30 hours for the ice balls to be ready. If you’ve followed all the instructions, the balls should be hard and crystal clear. They shouldn’t be cloudy at all. You can then store the balls in a storage tube, sold separately by Wintersmith. The cubes measure 2 inches while the balls are 2.36 inches or 60mm in diameter. To achieve clear ice without using an ice making machine, this ice chest uses the same scientific principles you’ll find at a frozen lake or pond. The water freezes from top to bottom because the earth is insulating the water at the bottom. As the water freezes, it pushes air bubbles further below, resulting in clear ice at the top of the lake. In Wintersmith’s ice maker, these air bubbles are completely pushed out of the molds resulting in ice that is completely transparent. This lack of trapped air bubbles also makes the ice harder. It melts slowly and is less likely to crumble when you put it in your drink. 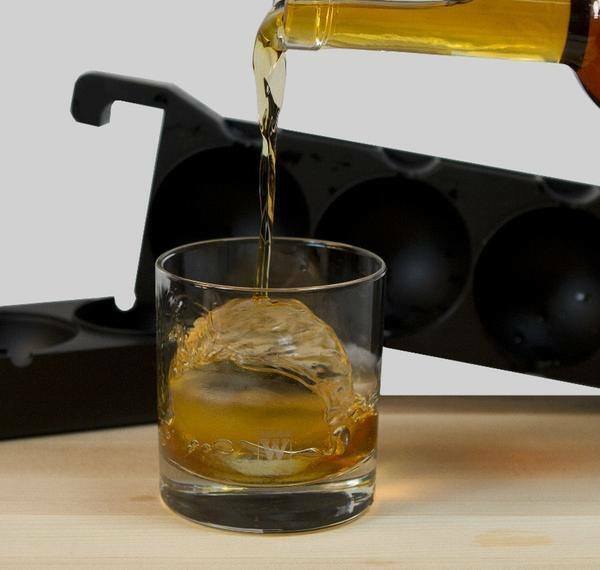 This is perfect for drinks that you don’t want to be diluted. Making clear ice using a home freezer has always been an elusive art. There are all sorts of suggestions online. Some people suggest using bottled water. Others say distilled water does the trick while others recommend boiling the water. While changing the type of water you use can remove some of the cloudiness, it doesn’t get you a clear ice ball. The Wintersmith Crystal Clear Sphere Ice Maker uses ordinary tap water to make gourmet ice. You don’t have to boil water or do some other magic. Just fill up the chest with water, insert the molds and let the water freeze for 24-30 hours. The resulting ice balls will be a perfect sphere and 100% clear.You can serve the ice immediately or store it in your freezer for future use. One thing I’ve noted is that these guys have excellent customer service. In the beginning, several Kickstarter backers complained about one of the components breakings. They got a free replacement immediately. The feedback from users so far from Amazon and around the internet has been positive. The ice chest, people say, is not a gimmick. It works, producing beautiful ice spheres every single time. There was a bit of learning curve for many. You have to know the perfect amount of hours to leave the water to freeze. For some, it’s 24 for others it’s 26-28. The most important thing is to avoid removing the ice too soon before it forms. By tweaking freezer temperature and freezing time, you’ll know what works best. I normally don’t recommend using a freezer to make ice. Ice makers are much faster, more efficient and produce more ice. I’ll make an exception in this case. You are not going to find any ice maker that makes ice balls that are these good at this price. I highly recommend it if you love gourmet ice balls with your favorite drink. If four ice balls/cubes are not enough for your needs, wait a while longer for the larger capacity Phantom Ice Maker. Don’t compromise the quality of your drink with cloudy ice balls or cubes that melt in no time. 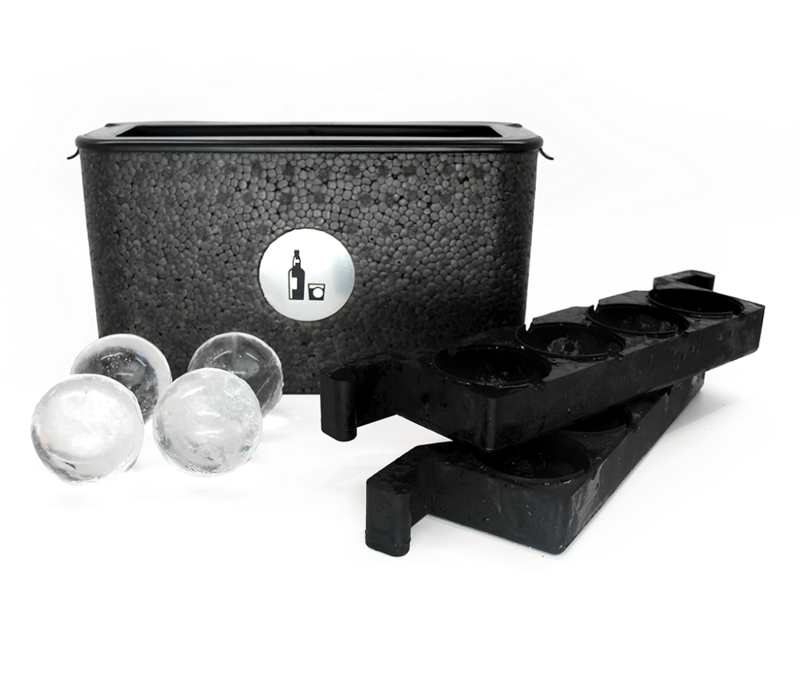 The Wintersmith ice chest makes ice balls that are not only better for your beverage but make it look elegant too. Download our FREE Buying Guide! 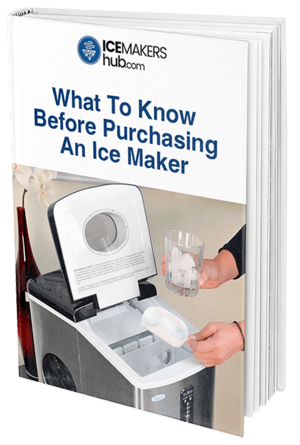 Download our FREE eBook to learn all about the leading ice machines and ice makers you can buy online. Vicky Norris is a legal professional who enjoys researching, reviewing and writing about the latest developments in home appliances. A fan of saving money, Vicky started IceMakersHub.com when it became clear that a whole new class of less-expensive portable ice makers began replacing what used to be a really expensive built-in kitchen appliance. Download our FREE in-depth eBook to learn about the best ice makers selling today.